Schaefer flat base cheek blocks distribute loads to a larger surface area than other designs that place loads on the mounting bolts only. Ideal for use on spars or the deck to lead sheets, halyards, reefing gear and any control line requiring a smooth lead. 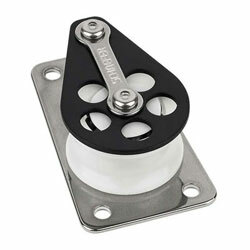 Ball bearing sheave provides a low friction lead.